Pakistan has established its first Internet Exchange Point (IXP) for all local ISPs that will help reduce latency rates for domestic traffic with-in the country to a greater deal. Internet Exchange Point (IXP) is a physical infrastructure through which Internet Service Providers (ISPs) and Contact Delivery Networks (CDNs) exchange internet traffic between their networks. The primary purpose of an IXP is to allow networks to interconnect directly, via the exchange, rather than through one or more third-party networks. Previously Pakistani Internet traffic was routed through foreign internet networks and exchanges, even for local (with-in Pakistan) traffic. This will change now as local peering will be allowed, ultimately resulting into lower pings and response times for domestic requests. Under the headship of Pakistan Telecommunication Authority and in collaboration with Internet Society (ISOC), this IXP has been established in the premises of Higher Education Commission (HEC). Syed Ismail Shah, Chairman PTA, while speaking exclusively with ProPakistani confirmed that IXP is up and running for last two weeks as a test. Dr. Shah said that hardware is being setup and exchange will formally be launched next month. Chairman PTA also said that more local internet exchanges will be set up in Lahore and Karachi soon. The IXP was one of the integral part of the Telecommunication Policy 2015 that has been implemented now. Internet and other traffic will be exchanged within Pakistan using local peering or exchange points as far as it is possible to do so, recognizing that the use of international peering points in other countries imposes an unnecessary cost burden and a potential security risk. PTA will take appropriate measures in consultation with stakeholders to encourage establishment of local peering and exchange points of IP traffic on legally established gateways in Pakistan. Internet Exchange Point is used to exchange local internet traffic internally with-in the country between ISPs instead of looking-up international exchanges and networks. 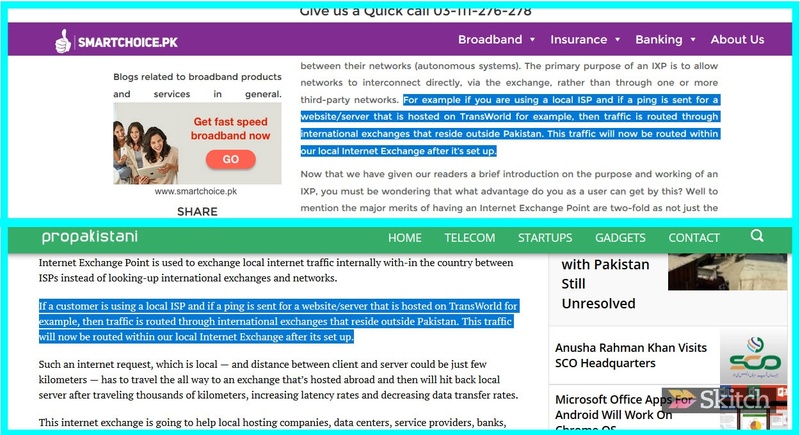 If a customer is using a local ISP and if a ping is sent for a website/server that is hosted on TransWorld for example, then traffic is routed through international exchanges that reside outside Pakistan. This traffic will now be routed within our local Internet Exchange after its set up. Such an internet request, which is local — and distance between client and server could be just few kilometers — has to travel the all way to an exchange that’s hosted abroad and then will hit back local server after traveling thousands of kilometers, increasing latency rates and decreasing data transfer rates. Ismail Shah said PTA has always encouraged new ideas and supported initiatives for the betterment of telecom sector. Setting up of IXP is one such new initiative that will help in improving internet access, business environment and local content. Not just PTA. Some Pakistani ISPs played a pivotal role in making this a reality including one or two that bore the bulk of the costs. It would be intersting to know how much of an average user’s traffic is local? My guess would be about 10% at best. So this probably means we’ll still get the same old performance for most of our activities. It will only help for P2P traffic like Skype etc. 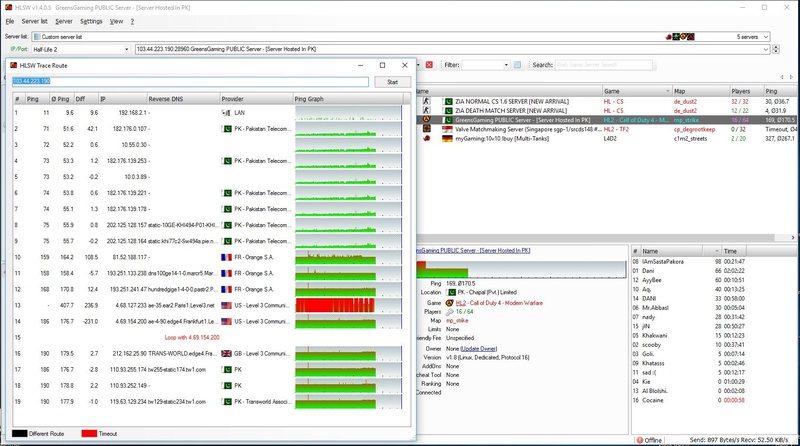 All local sites are hosted outside country, so no change for them. Online shopping sites having .pk domains would have good influence. Other than that CDN locally routed would greatly impact media delays. In my opinion, more than 40% of the traffic will be routed locally and the situation will improve with respect to time. I expect a default of 80% local traffic in future. To check your percentage, make a list of 10 websites you frequently visit, exclude social networking sites like facebook and chat messengers like whats app, then you could get the idea of the percentage of the local traffic you are generating. Chacha Noman, nowhere in the comment the word DNS is mentioned :P The difference indeed will only be felt if website is hosted within the country, or at least the CDN has a local node in the country. The difference will not only be felt by gamers, don’t be short sighted. And with the exception of gov and edu sites.. I didn’t mentioned that pk sites are hosted locally. I meant that in future online shopping sites (pk domains) “WOULD” have good influence (by have their sites hosted locally). Throughout my comment was a vision to the future but i didnt elaborate considering the readers smart enough to get the idea rather than criticize and lecture. Though I disagree with the 10% ratio, but this initiative will encourage CDN providers to offer Pakistan based content delivery node. It will end up speeding up allot more website at the end. I am interested in gaming pings only. Looking forward to. You used to get 56 ping before too ?? Good Job, after looooooooong time, they think about basic infrastructure requirement. Good Work, It was the requirement of time. It will not only save the international bandwidth but also improve the user experience since user will be fed below 50 ms. Being part of the setup from ISP end i see it to be the initial step. setting up of further value added services within Pakistan will make it a more success. PTA should take a step ahead in this by extended the HEC educational portals to all Pakistanis using this plateform. And cyril Alamida award goes to you for leaking this open secret. Article likha ni IT Experts pehle aa gae. Her kam mein se keeray nikalne wali awam. Good work by PTA and whoever did this. Now we can say our institutions are working on that type of issues too and thinking something about people. Copy / Paste Problem, publisher didn’t bother to read.